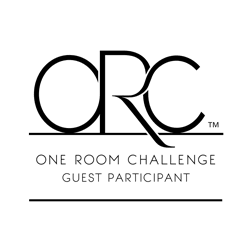 Welcome back to the One Room Challenge Week 4 – Starting a Collection! We’re just past the halfway point, and this week marks the start of something entirely new for me. Not a big thing, but for someone who loves to find vintage items, the Challenge has nudged me towards something I’ve wanted to collect for a while. But before we move forward, I thought I’d recap what I’ve done so far, for those who’ve missed the first few weeks. In Week 1, I started with a completely blank slate. 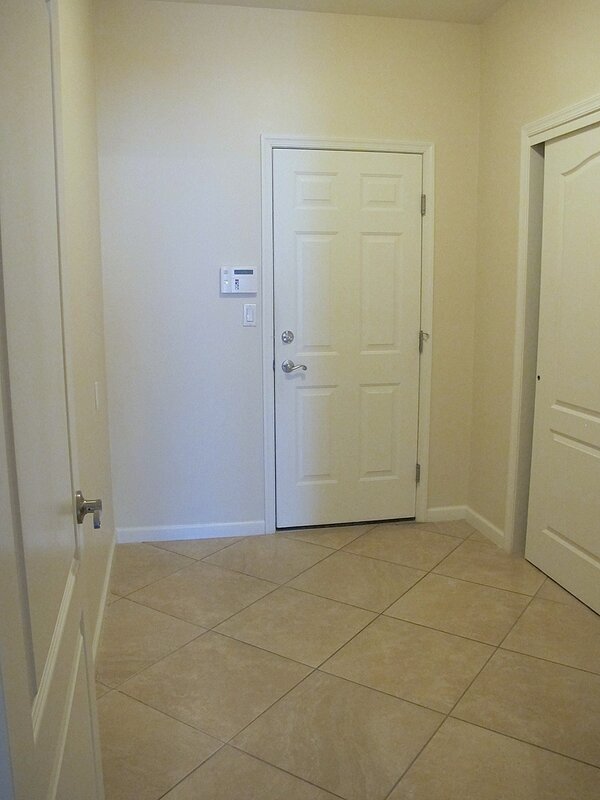 My back entry foyer was completely empty and the first week we looked at inspiration photos. 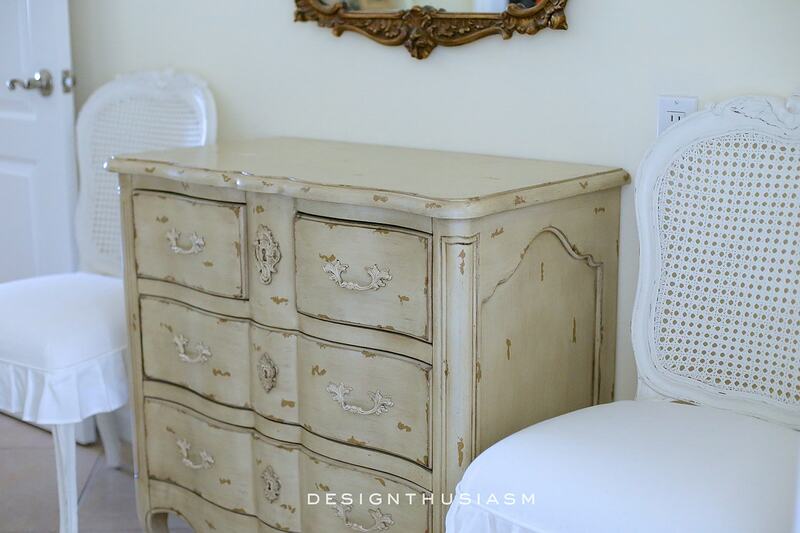 In Week 2, I began to add in the essential furniture pieces. Week 3 saw the addition of some personality through vignette styling. Which brings us to Week 4. This week I’m looking at a different section of this tiny space. I wanted to make sure there was something of interest no matter which direction you approached the space from. In the corner directly opposite the chest, there was a big, bland, nothing-to-look-at hole. Just entry door and closet and that was all you see when walking toward the door. But the corner was really, really, really small. 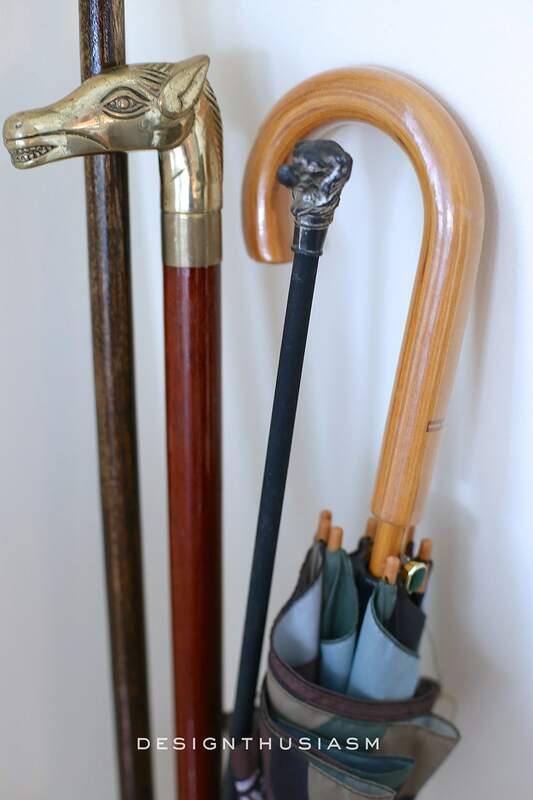 Easy solution… I’ve always wanted to collect walking sticks and an umbrella stand full of them was just the thing. The only problem? I didn’t have any walking sticks. Not a one! 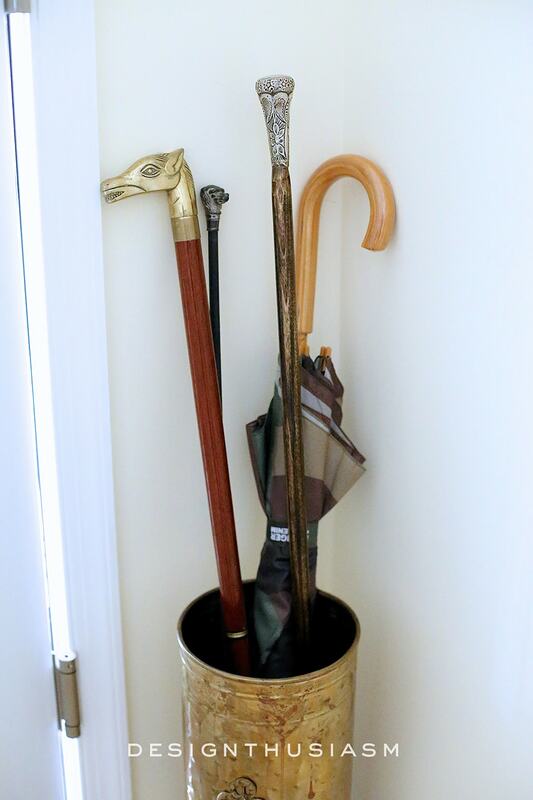 Step one was to find a vintage umbrella stand that would set the tone aesthetically. 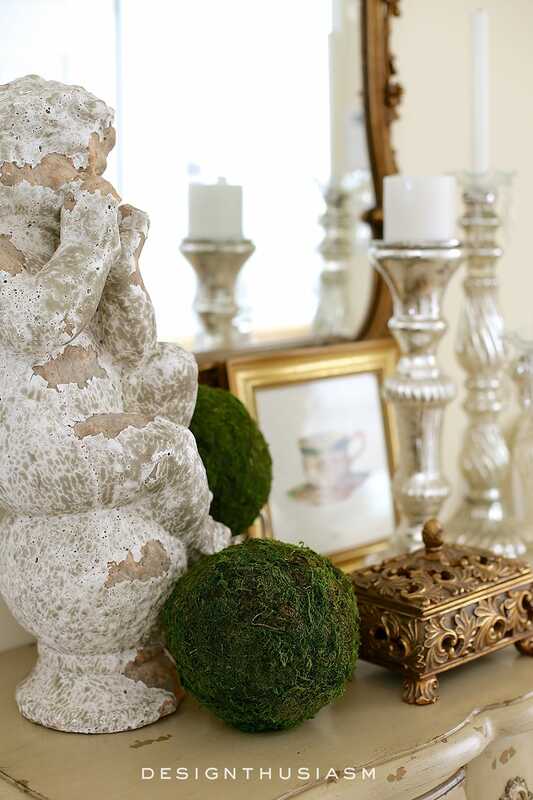 My tiny space couldn’t really accommodate a big open wooden stand and a little bling is always nice in a dark corner, so I found this antique brass stand with just the right amount of wear and patina. The next step was to actually start my collection. As any true collector knows, this really has to be done over time, to find pieces you love. So I set out to find just a few key pieces that would function ultimately as the foundation of my collection. 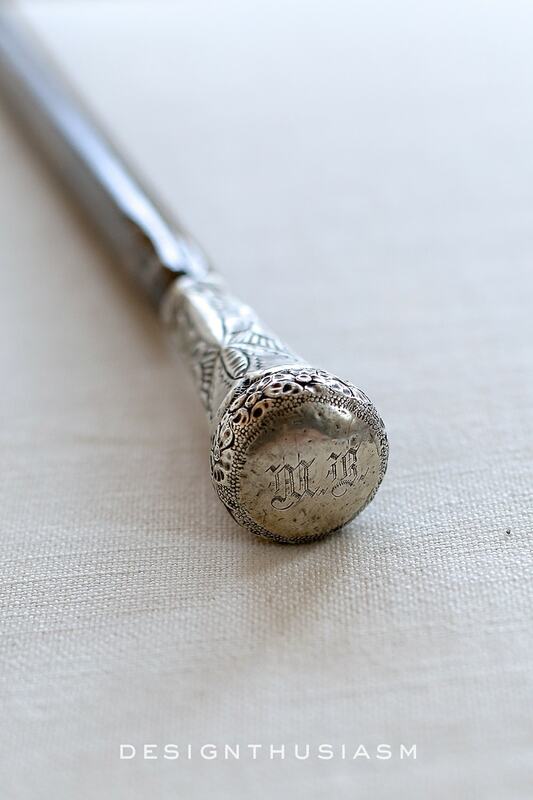 The first score was this lovely wooden stick with sterling silver knob, decorative flowers and engraved initials at the top. Since I was only starting out with a very few pieces, I wanted to make sure to balance the assortment with a mix of metals, colors, thicknesses and shapes. I noticed many of the offerings were European in origin. I particularly wanted to included a variety of imagery and I fell in love with this little long haired dachshund. 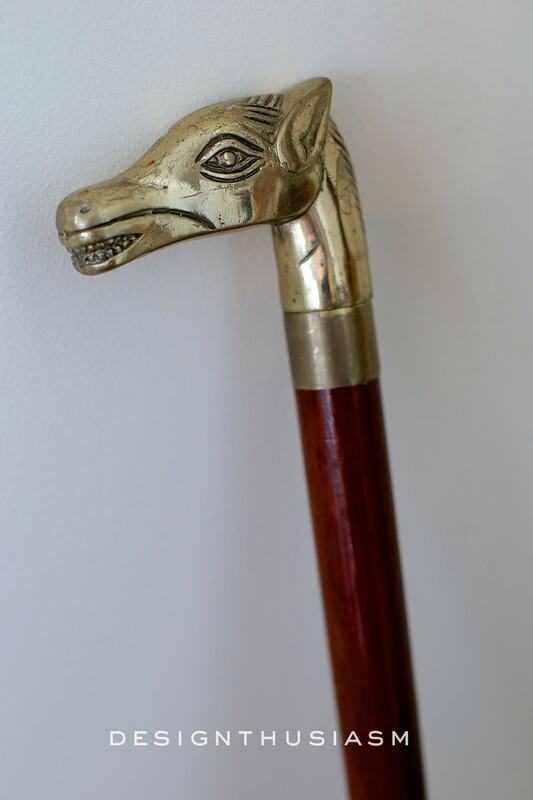 Rounding out my first few purchases, I opted for a brass stick with horse head handle. This is only just the beginning of my collection and I added in an umbrella to beef up the selection. It looks pretty sparse, but I can already see the character it will add to this corner. 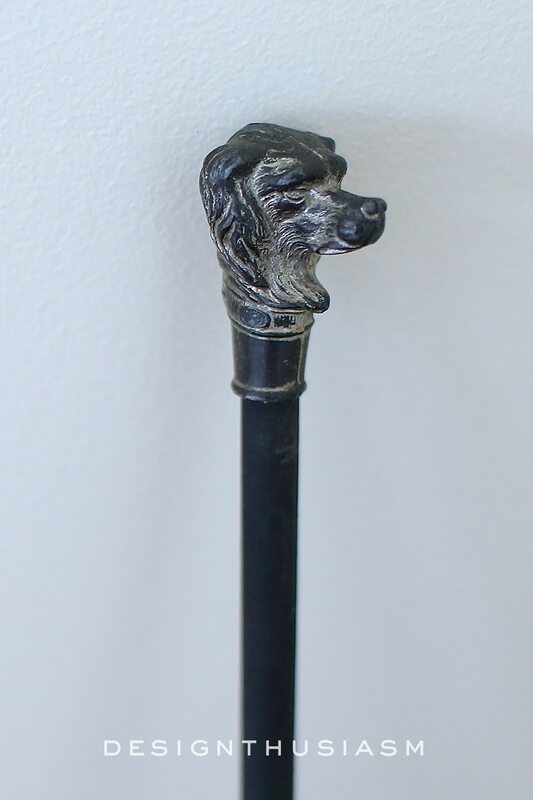 I’m continuing the hunt for new and different pieces to add to my now growing collection of antique walking sticks. Next week I’ll tackle yet another wall in this room. Please also take the time to visit some of the other links in the challenge, which can be accessed by clicking on the logo below. 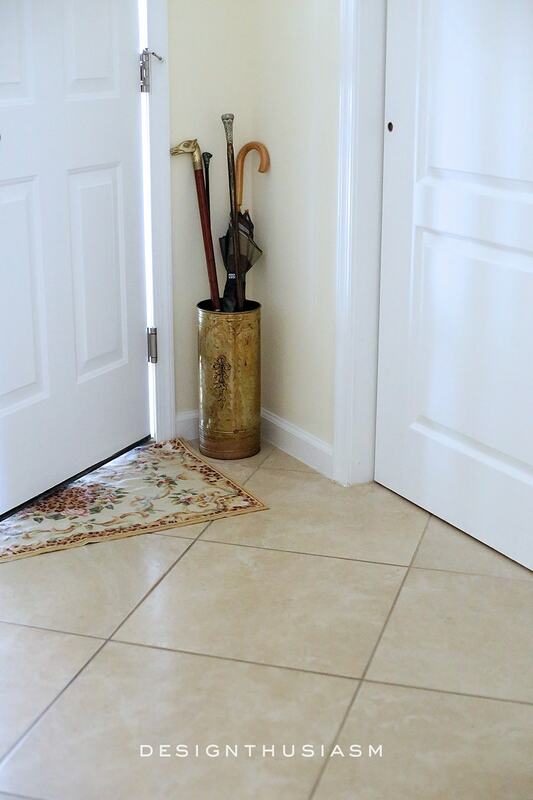 Love how your foyer is coming together! 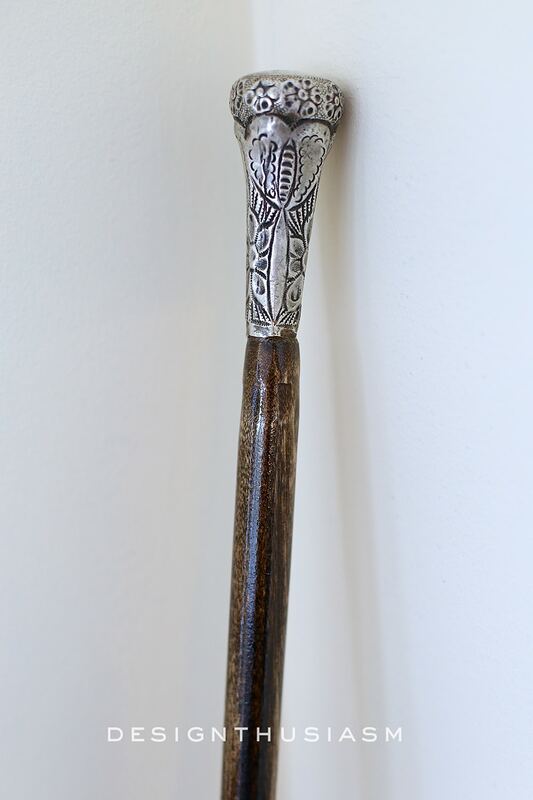 The sterling knob walking stick is my favorite. Love the initials! Thanks so much, Lani!! That one is my favorite too… 🙂 And the initials happen to be my mother-in-law’s initials, so I can pretend it’s a family heirloom… lol! The best part of this challenge for me is watch your methodical, step by step approach! I have just started working on my entry landing using this process (I am on week 2 in your design challenge, but it has taken me months to get there) and can finally see the end in sight! Thank you so much! What a great item to collect. The silver topper reminded me of one of my favorite movies “Enchanted April” where the lady stuck hers in the ground and it sprouted. I can’t wait to see how this room turns out. 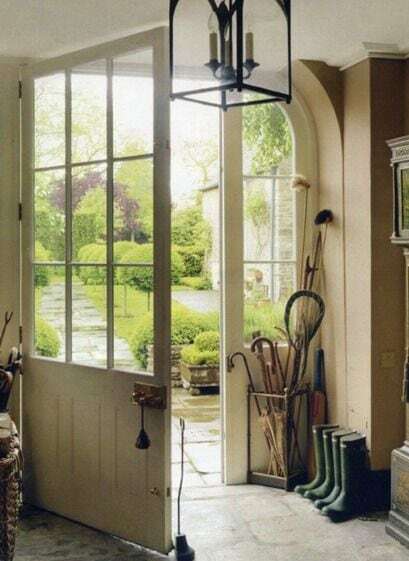 I’m certain it will be as beautiful as everything else you have put together. Perfect for that corner! 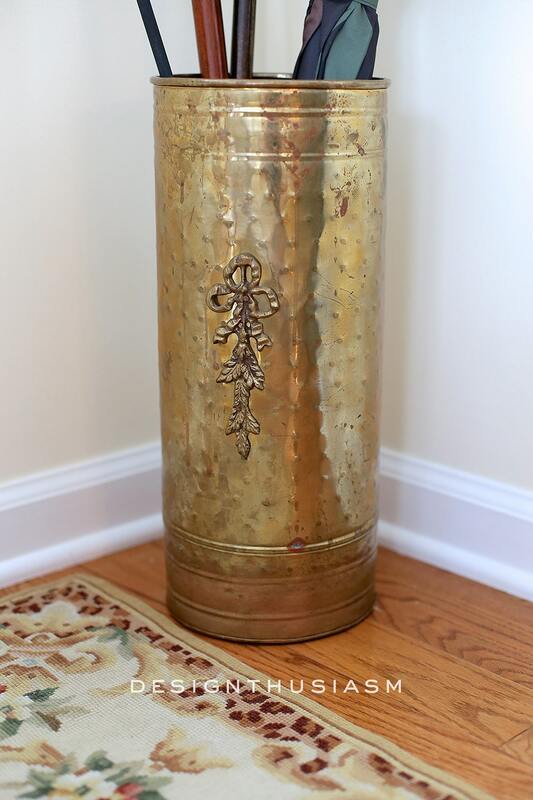 I love your umbrella stand with it’s beautiful patina. 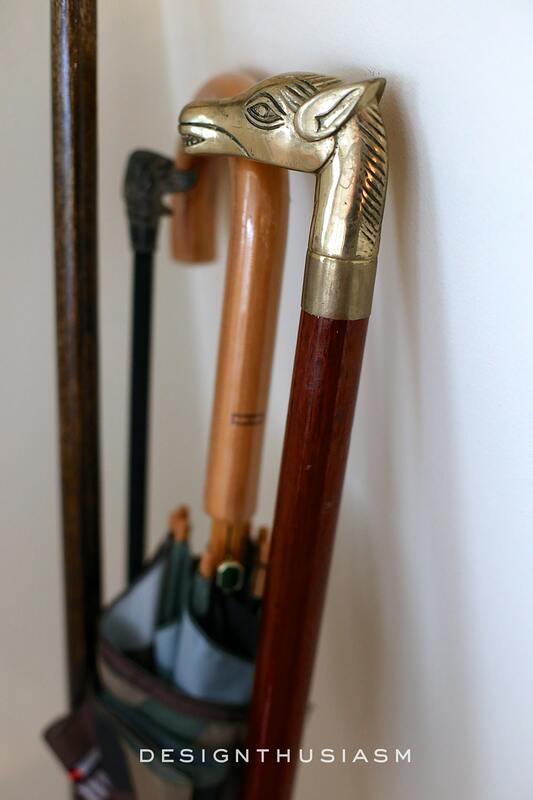 I have been collecting walking sticks for years and am always on the lookout for unique ones. Because ours are in our fox hunt room, I put them in hunter boots to match the theme of the room. Some kitty litter keeps them erect so they don’t all fall to just one side. Hugs!